What is the Compact RotaDairon Soil Renovator™? 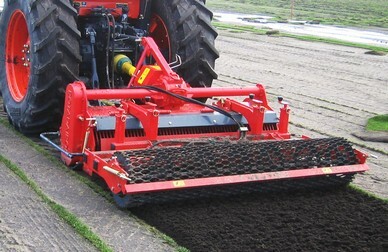 One of the main problems encountered when creating or renovating amenity areas (parks, private gardens and estates) and sports fields (football pitches, golf courses) is fine cultivation of top soil before seeding. That is why The Dairon Company, already world renowned for its heavy duty Soil Renovators have developed a range of compact Rotadairon soil renovators for all purposes : cultivation - levelling - burying of stones, clods and overgrowth, grass + debris - rolling. Utilization in overgrowth or on previously and deeply loosened soil cleared of big rocks. Ground speed from 1/2 to 1MPH according to working conditions.